Posted by Arun Rajagopal in Oman, Social Media, Travel. Muscat Festival 2009-10, originally uploaded by arunmct. In March 2007, an enterprising guy from Minneapolis, Minnesota, USA set out to see the world. Not before selling his thriving business and home, putting his belongings into storage and spending some time with his folks before getting on the road. For over 2 years, Gary Arndt has been traveling and blogging around the world armed with his laptop, camera and iPhone. On last count, he has visited over 50 countries. A few weeks ago, Gary was in Oman and I had the pleasure of hanging out with him. As someone with a deep interest in travel, I found Gary’s accounts of his journeys highly fascinating and very insightful. A visit to his travel blog Everything-Everywhere.com is more than a descriptive account of the places and people a nomadic traveler encounters. It’s a perceptive mirror of history, cultures, societies, quirky foibles, extraordinary experiences and the captivating minutiae of life across the globe. Gary is not on a mission to change the world with his travels. There is no cause to support or an agenda to push. There’s no poring over a guidebook and attempting to recreate an experience. Off-the beaten path is more like it. He does not make detailed plans before visiting a destination. He does not know when he will get back home. He is not perturbed that his cash will run out. He will probably not know which city will be next on his itinerary. He digs World Heritage Sites a lot. He enjoys meeting people in the places he travels to. He has been to those teeny-weeny islands in the Pacific that are probably unknown to many. Gary plans to write a book on his travels. It will be beyond a travelogue that recounts ‘I went here. I saw this. I did that’. A chapter in the book will be on monarchs that will offer a fascinating perspective of rulers around the world. One could be on the history of Marshall Islands. Speaking engagements are also in the pipeline. His amazing collection of travel photographs could fetch him moolah. Here are a couple of interesting thoughts that Gary left behind. He believes that a year of international travel is as good as four years of a university education. He says that a recession is the best time to travel around the world. Why would you want to work harder to make a living when all the economic forces are against you? You would rather go on a ‘sleep mode’ and then on a ‘refresh drive’ around the world. He believes that the skills you learn from traveling stand in good stead when it comes to work or life. He says that ‘cleanliness’ and ‘quality of highways’ are the best indicators of how developed a nation can be. He rates Muscat if not the best, among the best cities in the world. 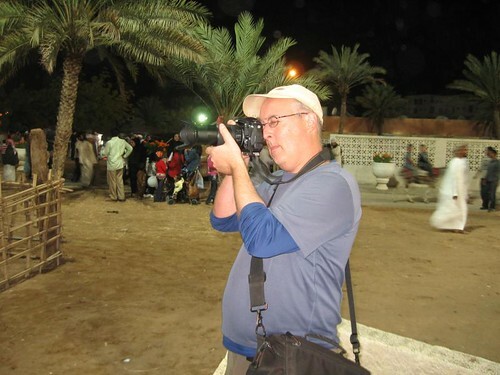 He chronicled the saga of the Musandam Ferry on his blog. (Here’s another account on Muscati’s blog). Gary ran from pillar to post trying to find information on the ferry. His experience on how essential information on a service that is meant for tourists is not easily available to them should be an eye-opener for decision-makers who want to attract tourists to Oman. Change is on its way. The National Ferry Company has just launched a website with the info. Hat tip to Sangeetha at the Digital Oman blog. His ride from Nizwa to Muscat is a fascinating testimonial of the outstanding hospitality shown by the people of this country. If you are a foreigner wary of the Middle East, Gary‘s experience will be a pleasant eye-opener. If it were not for him, I would not have visited the ongoing Muscat Festival at Rose Garden, Qurum. It took the company of a tourist for me to go and experience the magic that is happening in my own backyard. The Muscat Festival was a great opportunity for me to observe firsthand the amazing heritage and culture of this country, something I thought I already knew because I have lived here for 16 odd years. How wrong I was. A blog post on it is in the works. People like him are the best brand ambassadors Oman can ever ask for. A few months from now, he might sit in a remote corner of the world and regale the locals there of how his arrival in Oman coincided with the country’s famous Gulf Cup victory. Hundreds of readers of his blog will learn about the Musandam Ferry fiasco. His book might feature an anecdote on his Nizwa ride and sharing lamb meat sticks with a stranger’ experience. I wish Gary happy travels. Do follow his journeys on his blog. If his experiences motivate you to see more of the world yourself or make you look out more from your little shell, I’d say go for it. Gary was profiled by ‘The Week’ during his visit to Oman. Read the story by Sujit Kumar.